#gloriator at @Tobacco_Factory Brewery Theatre. So funny, so clever, so much cardboard. Original, clever and hilarious theatre @tftheatres tonight. Laughed and was inspired in equal measure at #Gloriator. 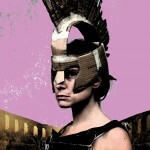 #gloriator at the @Tobacco_Factory tonight was utterly hilarious. Talented talented ladies. Nearly bust a gut tonight at #Gloriator at @tftheatres. So so funny. And clever. And silly. And did I mention funny? Bravo @spitzandco! Kick off with Mardi Gras from the wonderful 8 piece Brass Junkies 29th Oct…..